As a young archaeology student, Elizabetta Celestino is completing her thesis and is fascinated by ancient Roman astrological symbols and the existence of a pre-Christian cult. After a traumatic injury and personal tragedy, she decides to become a nun and devote herself to Christ and the church. However, forces beyond her control are pulling her away from the life she has chosen. On the eve of the Conclave, a cave collapse at the catacombs where Elizabetta once studied leads to an investigation into an ancient Roman sect, intertwining three timelines: Nero and Ancient Rome, the playwright Christopher Marlowe and Elizabethan England and present day Vatican. With the help of her brother Zazo, a Vatican policeman, her sister Micaela a doctor in Rome, and her father, a respected mathematics professor, Elizabetta is unwittingly pulled into a centuries old battle between good and evil, the outcome of which could lead to the end of not only the Catholic Church but civilization and the world as we know it. I found the timelines involving Nero and Marlowe very well written and captivating and would have enjoyed the novel much more if the same level of writing and development had been applied to the present day timeline involving Elizabetta and her investigation. 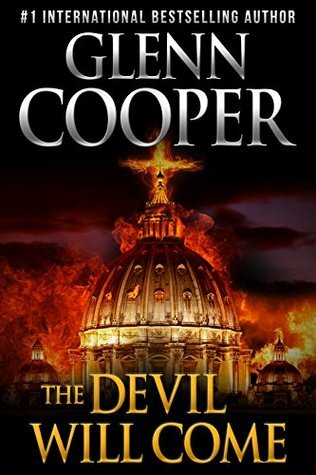 Although not my favourite Glenn Cooper novel, The Devil Will Come was an interesting and intelligent take on the Malachy prophecy, weaving together both fiction and fact into this story of historical fiction. I’m looking forward to the final Glenn Cooper novel on my reading list, The Resurrection Maker. Check back soon for the review! Thank you to NetGalley and Lascaux Media for providing me with an e-book copy in exchange for an honest review.